"There's a food holiday for everything" (I'm looking at you National Broccoli Day). Despite the saturation of niche food holidays and overly quaffed content generation that most of us ignore, Doughnut Day deserves my attention and yours. Not for freebies, although perhaps for some of you that's the main draw. After all, it's your one chance a year to take something from a large corporation; a menial but well deserved freebie that somehow balances the scale for the hundreds of dollars you might throw at them over the course of a year. Or it can be the day that you appreciate the local people in your community, your literal neighbors, who wake up at three or four o'clock in the morning to make you something that isn't arriving frozen on a truck or inspected on a conveyor belt by an 18-year-old kid who ignores the employees must wash hands sign in the bathroom. So instead of telling you where you can get free doughnuts on this most holy of doughy days, let's focus on our local gems, who you can support by buying (GASP) doughnuts. True most gas stations sell doughnuts, but in Oakland they are being made fresh by local baker Amanda Eubanks. Inside the Chevron station at W. Colonial Drive and Tubb Street you'll find her full doughnut operation. Don't let the location of her business fool you. Amanda is no rookie. She attended Le Cordon Bleu, has owned her own bake shop, was the Head Baker for 4Rivers, and now she's feeding us all the goodness she can crank out everyday (but Monday). Being creative with retail space, thanks to a city that is pushing it's potential businesses further from Orlando with ridiculous rental prices, is what works in her favor. Being flexible and seeing a different vision from the norm is why she's a boss. Her yeast doughnuts are light and always topped and filled with creative new flavors like dirt cake or a new favorite Peanut Butter Banana. However if you ask her what her favorite is she will tell you it's the classic glazed. She has six rotating doughnuts flavors daily, powered sugar and cinnamon sugar doughnut holes, and fritters the size of your head (literally). Do your best to get there early because she sells out quickly. The hours are 7 a.m. until 2 p.m. or sell out. Celine, queen of the square, vegan doughnut, is a powerful force to be reckoned with. She works hard, she suffers no fools, and everything she tackles she conquers. 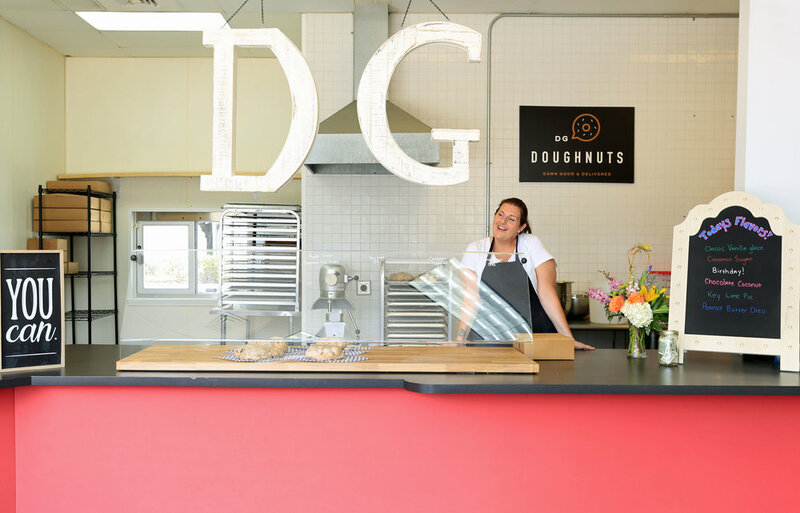 It's no surprise that when she added doughnuts to her bakery's repertoire they became an instant buzz-worthy item allowing her to open up a sole doughnut shop. 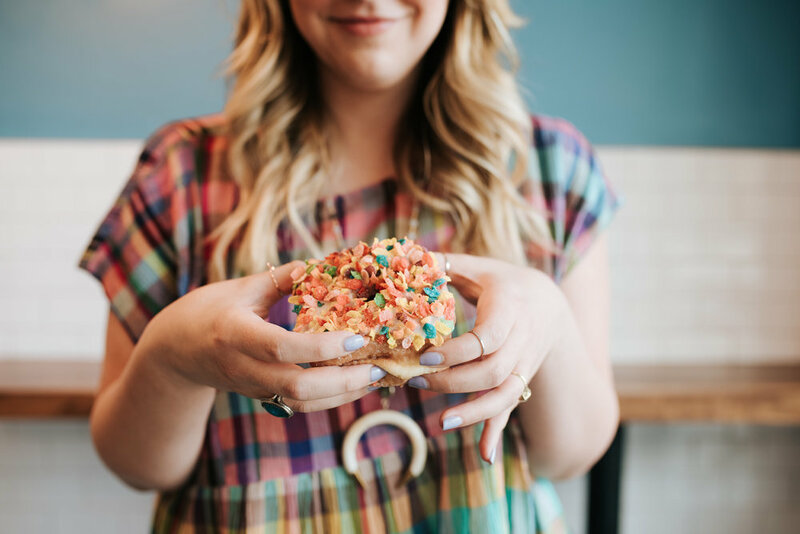 She may not be the only local baker to make a fruity pebbles doughnut, but she certainly makes the best one I've had. My other favorites are churro and literally anything she makes with matcha. Scoff at the price per doughnut if you want ($3), but these doughnuts are so large they can be tough for even the most skilled dough eaters among us to consume in one sitting. Well made, hand-crafted, delicious things aren't cheap. And they sure aren't free. The hours at Valkyrie vary, during the week she is open until 6 p.m., Friday and Saturday til 9 p.m. and Sunday until 6 p.m. I think Orlando has finally caught on to the Buttermilk craze since their lines increase every weekend. I almost miss the quiet days I would visit them at the local Farmers Markets, but having them available to me six days of the week is pretty satisfying as well. This family-owned bakery was tinkering with doughnut recipes during their pop-ups back in the day, but we've grown accustom to filling up on croissants and pop tarts. However if you, like me want doughnuts over pop tarts all day, they now have their own gooey recipes of small batch doughnuts to enjoy on both Saturdays and Sundays! Also as a special way to celebrate National Doughnut Day they will have doughnuts this Friday June 1st. 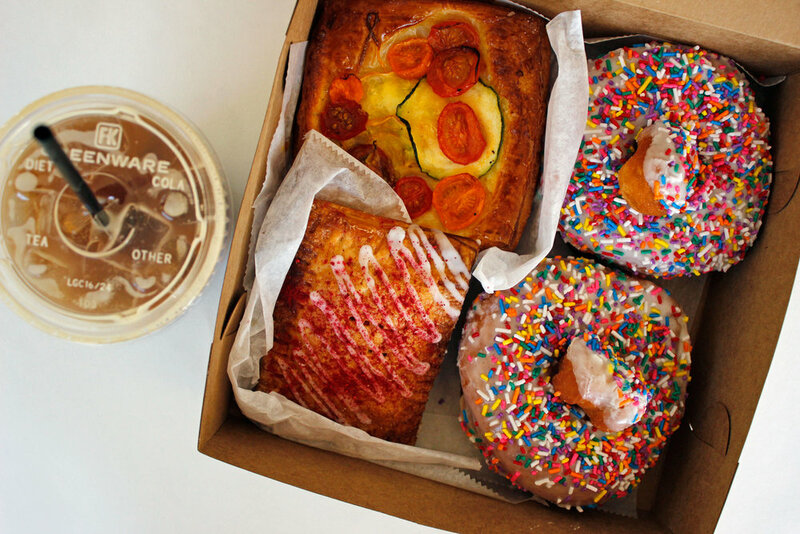 My love of doughnuts caused me to wake up at 7 a.m., leave the house un-showered and drive 45 minutes to Mt. Dora to check out Joy Donuts. If you do the same you will find the brightly colored and well-branded pink trailer at the corner of Wolf Branch Road and Hwy 441. As the sun starts to hit minutes before the window opens at 8 a.m. and the line grows longer, no one complains. They wait quietly and patiently for their weekly fix. As a newbie I was welcomed by those in line around me as people gave me the rundown and shared their favorite flavors with me. More than a dozen options are on the menu board for you to choose or you can do an online pre-order for a quick pick up. These are cake doughnuts, smaller in size than other shops around town, but I enjoyed them. Each one was a solid, moist doughnut and as I tried pieces from each different flavor none of them sent me into sugar shock. Call it sweet simplicity, but even with their array of toppings and glazes they weren't trying to hard. They just wanted to be good salt-of-the-earth doughnuts. The price for a dozen is $13 so if you have to spend a little more on gas to get there from Orlando, it shouldn't hurt your wallet too badly. Note that they will be taking a summer break after the first Sunday in June, so make sure to follow them on Instagram or Facebook so you know when to go. If you've ever tried to get some doughnuts from the Little Blue Donut Truck at Tasty Takeover on Tuesday nights you may have given up due to long lines, but keep at it. Their doughnuts are made fresh in the truck to keep up with demand and served warm with toppings prepared by each order. One of my favorites was an unexpected combination of Peanut Butter & Sriracha. They travel pretty regularly around the city to different events and festivals so follow them on Instagram to keep track of where they go. One day I hope their little blue truck sits next to my favorite blue coffee truck and delicious worlds collide. Donut King has been around for 10 years, but because it's first location was in Minneola many Orlandoans may not have ever made the drive to visit. Now that they have a location in Winter Park (on Howell Branch Road) we can get doughnuts from 5 a.m. to 9 p.m. any day of the week. My personal favorites are the cherry and blueberry doughnuts, red velvet, and recently the Sour Patch Kid doughnut. I don't know much about the people that own the Donut King to sing their praises, but their website says they are locally owned so that in itself is worthy of supporting. They may have the most convenient hours being open every day of the week from 5 a.m. to 9 p.m., so you should never have a problem getting your doughnut fix from one of their two locations. If you haven't heard of Donut Central it's because they aren't open yet. However very soon, potentially in August, a new doughnut shop will emerge in the old Sleeping Moon Cafe location at S.R. 436 and Aloma. Donut Central is locally owned and will be making doughnuts, glazes, and fillings in-house from scratch. They are currently developing their menu to have non-traditional doughnuts and appropriately enough for an old coffee house, they will serve their own specialty coffee. Even with the first location still being built out a second location is already in the works. Follow their Facebook page for more updates as the opening gets closer. 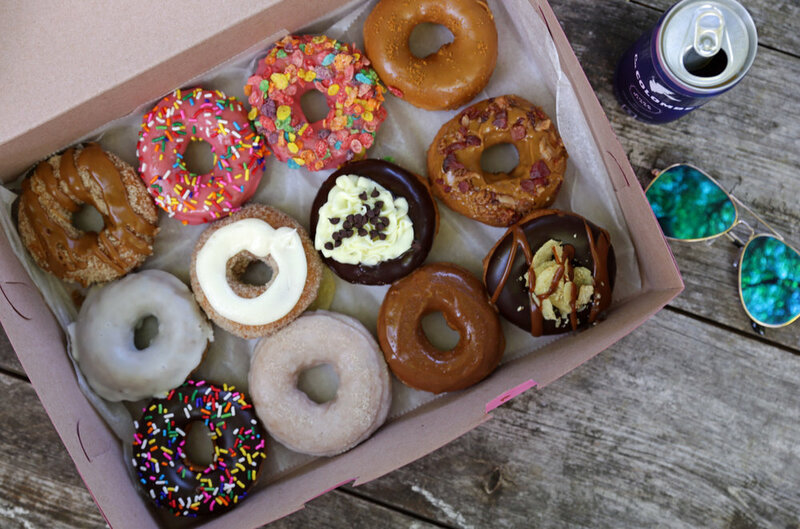 You don't have to live in Orlando to enjoy some solid doughnuts. Sanford has it's own doughnut shop on 1st Street. The prices here are very reasonable and they have great selection of flavors. On the weekends they close at 2 p.m. so you have to hustle to get there before they run out or close. If you are someone who uses the SunRail, their location isn't too far from the Sanford stop. 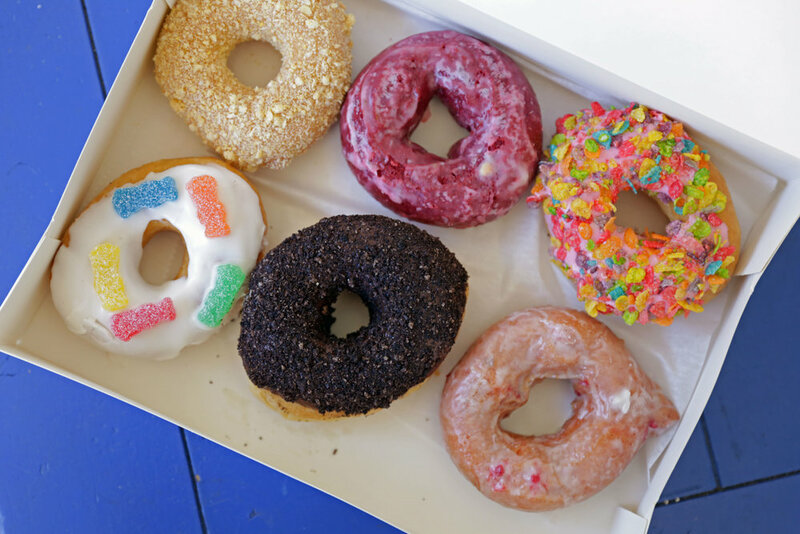 Grab some doughnuts and take them down to the waterfront of Lake Monroe and enjoy. All doughnuts were paid for by me, I don't ask for free food, I support local businesses. All images are mine except the images of Valkyrie which were taken by my friends Fox + Film Photography. Don't be a terrible food blogger, you are ruining it for the rest of us who love food.